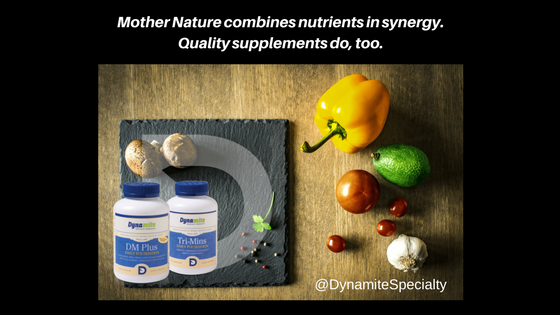 The Dynamite Foundation Program is a synergistic combination of nutrients designed like Mother Nature intended. An optimum supplement requires a combination of the most commonly known vitamins and minerals, as well as the lesser known but vitally important trace minerals, amino acids and other factors. Additionally for a supplement to work, the forms of each nutrient must be considered. The list below gives a brief synopsis of the many benefits of the ingredients in our Foundation Products. When constructing this program we also included our own proprietary blend of herbs, phytonutrients, amino acids and enzymes to improve digestion, absorption and utilization of all these nutrients. 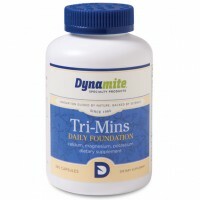 The Dynamite daily foundation program includes DM Plus and Tri-Mins. Why do you need Tri-Mins if DM Plus is so complete? A product that “fits all” is a marketing mirage. While it’s not your typical supplement, we separated the macro-minerals Calcium, Magnesium and Potassium (and their co-factors) because they are needed in varying amounts depending on age, puberty, menses, physical activity, stress and more. By segregating those nutrients in a separate bottle you are able to increase/decrease as needed personally. Since people aren’t all the same, this allows for adjustments. However, if want to “set it and forget it,” take 4 capsules of each daily to cover the bases. Do you understand the difference between high quality nutrients and the cheap stuff? DM Plus contains mineral forms that closely duplicate the natural chelation process which occurs in the body. This means the mineral is ready to be absorbed when you take it. Inorganic minerals (and poorly made chelates) are large particles that cannot easily pass through the intestinal wall. Dynamite’s chelated minerals have molecular weights small enough to easily be absorbed. Additionally, the process of chelation results in the final mineral compound becoming neutral, i.e., containing no electrical charge. This is important because electrically charged mineral compounds are reactive and can deactivate other important nutrient factors, such as vitamin E, ascorbic acid, various B-vitamins, and certain medications. Vitamins in highly bioavailable forms that do not require the usual conversion by the liver, but are transported directly to their sites of action, enable the body to use the vitamins more efficiently for optimum effectiveness at lower potencies. Examples of these high quality vitamins and cofactors include: Methylated B12 (methylcobalamin) and B9 (L-5-methyltetrahydrofolate), coenzyme forms of B1, B2 & B6 (Pyridoxal-5-phosphate, Riboﬂavin-5-phosphate & Cocarboxylase), the natural forms of vitamin E: d-alpha tocopheryl and tocotrienols, and the incomparable Ester-C® (a pH neutral form of vitamin C that contains naturally occurring metabolites that activate the vitamin C molecules making it easier for the body to transport them from cell to cell for numerous health benefits). Nearly every supplement in the country uses chemical flow and anti-caking agents such as silicon dioxide, magnesium stearate and others. These chemicals interrupt reactions with water so the supplement is easier to encapsulate.The problem with using these excipients, aside from chemical toxicity, is that nutrients need to react with water to be absorbed and utilized. Therefore, chemical flow agents work against the effectiveness of the supplement.